The scenario at Battlefront's repository will take some time to appear, so I uploaded the scenario in my Google site. The download link is at the bottom of this Google site page (the small arrow). The page includes a full briefing. Comments are welcome! Look's very interesting. I'll have to check it out when my schedule allows. I understand what you are saying about getting every little detail correct... I think the best you can hope for in any game that is recreating a real event is to start with a setup as close as possible. Really the little details are rarely important, it's more important in my opinion to get the flavor of the action correct. Once you hit the start button all resemblance to the real event will fly out the window anyway. I'm interested to hear a comparison to the other game you played this scenario in. Interesting. What about ARMA2? You can script the events but do you have the assets like the AAV? Arma 2 could work, but commanding the entire thing would be a nightmare, even using the HC module. I still can't get subgroups to pass orders down or enter vehicles, so I think this would be a tough one. I agree. I could not figure out how to work with the real life very fluid situation across the Saddam Canal. Do you think I cut the blue forces too short in the CM scenario? ARMA 2 would do it to a certain extent, but Desdinova is right. Commanding vehicles is a bit of a nightmare. I need a good and nice bridge. Do you guys remember in which ArmA 2 map do we have a good and long bridge? For an Arma2 map with a bridge fitting the theme, I recommend 'Faysh Khabur Iraq' by Blackmamba. 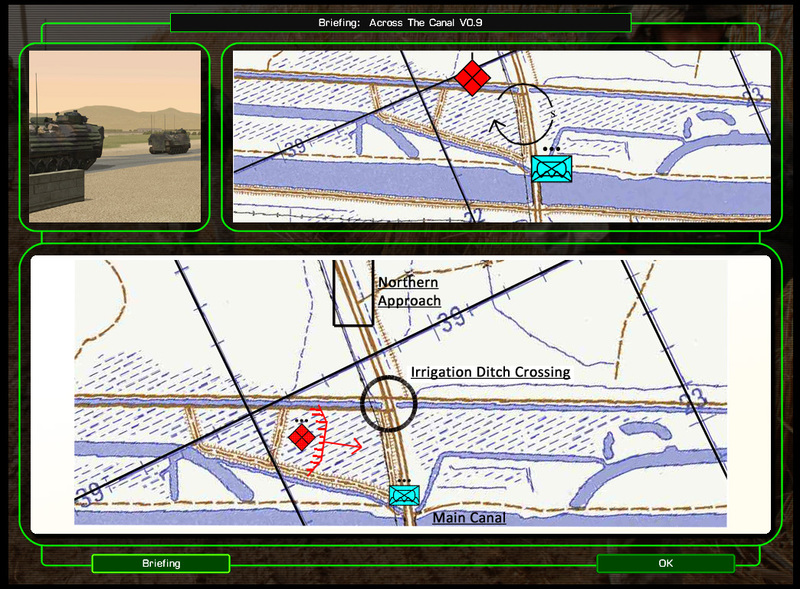 This map is one of the few with bridges that are understood by the Arma2 AI. Sadly, on most Arma2 maps, the AI is unable to cross the bridge when threatened. The map features two long bridges. The northern most bridge(near Fisxabur on the map) works fine for tracked vehicles. There is a small settlement on the east side of the bridge, but nothing approaching a city. Cool! Thanks! I will take a look.